If you forgot your password and locked out of your computer on any of the Microsoft Windows operating systems above, this will help. This is a password Unlocker Tool which we create for your specific computer and send to you on USB or CD. We will help you over the phone to install and apply the utility to get your system unlocked. It is cheap and it will get you back into your computer. If you have another computer to work on and you are on our website now, add the service to your cart below and check out. We will be notified when your order comes in and call you with instructions on how to proceed. If you are locked out of your only computer and found this page from a search on your phone. Call us now at: 239.254.9206. We will take your order over the phone. Let us know which operating system you are using on the locked computer. Or add a note during checkout. We will generate a special Unlocker Tool for you. It will be specific to your computer and we mail it to you. It will arrive on a USB or CD (your choice so let us know which you prefer). When your CD or USB stick arrives, call us. 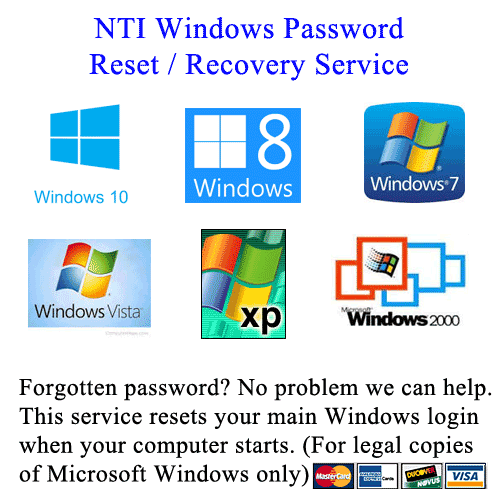 We will walk you through the process over the phone to complete the reset and get you back into your computer. This will remove the password on the user account that you choose in the utility. You will then be able to recreate your password if you like. Guaranteed to reset your password or your money back. Works for Windows 10/8.1/8/7/XP/2000 operating systems 32 or 64 bit . Laptops and desktops only any brand. No tablets, or Server operating systems. One time flat rate fee. USA, Canada, Alaska and Hawaii only. Free Ground Shipping from FL. Expedited options available during checkout. This will require assistance from you but we will walk you though everything over the phone. It does not take long.